Starting the Fingerboard: Many makers use prepared boards, but those still need a lot of work, so I find it just as easy to start with a raw block of ebony like the one on the left. On the right is a block that I've flattened on the back and trimmed exactly to final width. I've marked the final thickness on its sides and have begun to plane the top down to those lines. Next I'll shape the familiar round top. The block is held in a jig in my bench vise while I plane it. Roughing the Top of the Board: Initially, lots of wood needs to be removed and neatness isn't critical, so I use a plane with a special blade that takes the wood off quickly, leaving ugly facets. When I've gotten close to the final shape, I'll switch to a more precise plane to shape the top as perfectly as possible, and then I'll scrape it smooth. Gluing on the Board: I carve out the hollow on the underside of the board, and then glue the board onto the neck. The neck and heel are still unfinished at this point because the lower part of the neck is fit to the board, not the other way around. The templates shown are used to shape the tops of fingerboards and the tops of bridges, respectively. 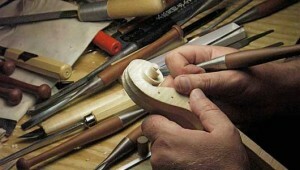 Marking the Heel Shape: Virtually everything on a violin is done to a plan, often using a specific template. This template is used to mark the taper of the heel. It's very important that the taper is centered perfectly and made to the correct dimensions, so that the button comes out the right size and in the right place! Roughing the Neck: With the board and the marks on the bottom of the heel to guide me, I chop away as much extra wood as I can. If there's a "rule" in violin making, it's to use the largest tool you can for the job—the one that removes the most wood the fastest—and switch to a smaller and more precise tool only when you're afraid your next cut may ruin something. Finishing the Neck: In this case, the next finest tool is a very rough rasp. Then I continue with finer rasps, files, and then finally scrapers and sandpaper. After this I'll have the neck very close to finished, but since the heel is carved after the neck is in place on the body, there will still be more to do to it. Ready to Set the Neck: With the neck almost finished, although neither the body nor the neck is completely detailed, it's time to put them together.